We are very sorry to inform you that we currently cannot ship to the United Kingdom. We deeply apologize for the inconvenience. Everything for superb cooking and stylish gourmet moments. Register for free now! Easily manage your addresses, orders and personal wishlist in your customer account. myWMF Grand Gourmet customers receive 5% off all orders in the WMF online shop. * Grand Gourmet status is awarded to myWMF members who have spent over 100 euros in the last 12 months.The figure is calculated from your purchases in the online shop less returns. If the annual figure is not reached, you automatically return to Gourmet status.  In subscribing to the WMF Newsletter you agree to the use of your personal data for the purpose of forwarding the newsletter. You can unsubscribe at any time. Our data privacy declaration, along with a statement of your additional rights can be found here . *The 10% discount for the new registration to the newsletter is valid within the next 3 months and can be redeemed only once either in the WMF Online-Shop or in a WMF store (not in WMF Outlets and in the factory outlet). Only one discount code can be redeemed per person, per order or per purchase. Discount codes cannot be combined with other promotions or vouchers. This voucher cannot be exchanged for cash. Yes, I would like to subscribe to the WMF Newsletter. Wide pouring edge for drip-free pouring. Silargan pots are suitable for all stove types, including induction. Bottom with pulled through steel core with fast heat conduction and perfect heat storage for energy-efficient cooking. Material: Silargan - dishwasher safe functional ceramics. Easy to clean non-porous closed surface, cut and scratch resistant and tasteless. Nickel-free inner and outer ceramic Silargan surface. Made in Germany - Premium quality, produced in-house in Germany. 30-Year warranty for the inner and outer ceramic Silargan surface with intended use. The Silit shallow casserole pan is guaranteed to become a firm favourite in any kitchen. Especially since it is so practical and talented: fry your meat, pour in your sauce and cook slowly on the hob or in the oven – all in one go. Who needs a frying pan and a deep casserole pan when you can do everything in the one pan: tender, succulent stews and tasty beef casseroles have never been easier. Thanks to the raised rim, hardly any fat splashes over, and only a small amount of liquid is needed for stewing. At the same time, the rim is lower than on the deep casserole pans, allowing liquids to evaporate faster and meat to be turned easily. Since the shallow casserole pan is a kitchen classic, it is included in all 4-piece Silit pan sets. The high-quality Silit Vitaliano cookware in the trendy colours Vanilla, Rosso and Nero is not only extremely attractive, but also extremely convenient – appealing to more than just lovers of Italian cuisine. Whether you’re preparing a small meal or several courses, the Vitaliano family has the right pan for every occasion. For example, the saucepan can be used for simmering a fresh tomato sauce, while gently cooking fish and vegetables in the steamer. The braising pan can be used to rustle up a gourmet meat dish, while ensuring pasta never boils over in the pasta pot with insert. And thanks to the see-through lid made of heat-resistant glass, you can keep an eye on what’s cooking at any time. The hollow handles are ovenproof and the wide pouring rim facilitates pouring and draining. The series with the non-porous closed Silargan surface also includes a deep and shallow casserole pan and a stewpot in various sizes as well as a stockpot (8.5 litre). All items can be cleaned in the dishwasher and Silit gives a 30-year guarantee on the inner and outer ceramic Silargan surface if the product is used as intended**. ** The 30-year guarantee is for the inner and outer ceramic Silargan surface of the cookware. The guarantee only applies if the product is used as intended. Further details about the scope of the guarantee and proper use can be found in the instructions for use enclosed with the products. Certified by the EHI Retail Institute GmbH. *The 10% discount for the new registration to the newsletter is valid within the next 3 months and can be redeemed only once either in the WMF Online-Shop or in a WMF store (not in WMF Outlets and in the factory outlet). Only one discount code can be redeemed per person, per order or per purchase. Discount codes cannot be combined with other promotions or vouchers. This voucher cannot be exchanged for cash. Yes, I would like to subscribe to the WMF Newsletter.